It’s no secret that the Federal Communications Commission’s (FCC’s) broadband data is unreliable. Many people, including U.S. Senators, have pointed out how federal data collection methods overstate connectivity across the country. Rochester, Minnesota, is no exception. In this policy brief, we highlight the gulf between FCC broadband data for Rochester and what’s actually available to residents by examining local competition. 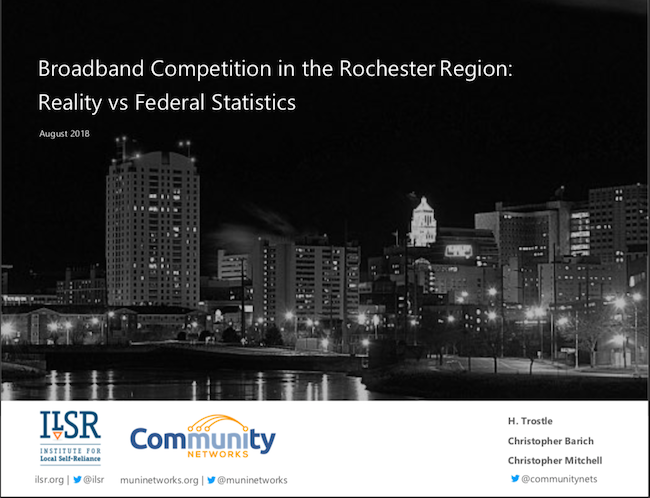 Download the policy brief Broadband Competition in the Rochester Region: Reality vs Federal Statistics here. As we’ve covered before, the FCC collects data by census block, which incorrectly inflates broadband access and competition data. Internet service providers self-report and describe an entire block as “served” even if they can only connect one address in that census block. In our analysis, we discovered evidence that at least one provider in Rochester had exaggerated its download speeds when submitting FCC Form 477 by a factor of 24. In rural areas surrounding Rochester, at least 42,000 people do not have access to wireline connectivity, relying on less dependable fixed wireless services to connect to the Internet. Within Rochester city limits, most residents have access to broadband and limited competition, with Charter Communications and CenturyLink vying for subscribers. For about 19,000 people, however, Charter is the only Internet service provider offering speeds that meet the FCC’s minimum standard for broadband. If a Rochester resident wants or needs faster Internet access speeds, competition drastically declines; more than half of all residents can only access 100 Mbps download speeds through Charter. The eight maps presented in the policy brief further explore broadband competition in and around Rochester, with varying levels of detail. Three maps take a wideer view of the region, displaying the digital divide between Rochester and its rural neighbors. The remaining five maps focus in on the city, showing which neighborhoods have a choice among multiple Internet service providers and which are stuck with one monopoly provider. Download the policy brief Broadband Competition in the Rochester Region: Reality vs Federal Statistics to view the maps and learn more.